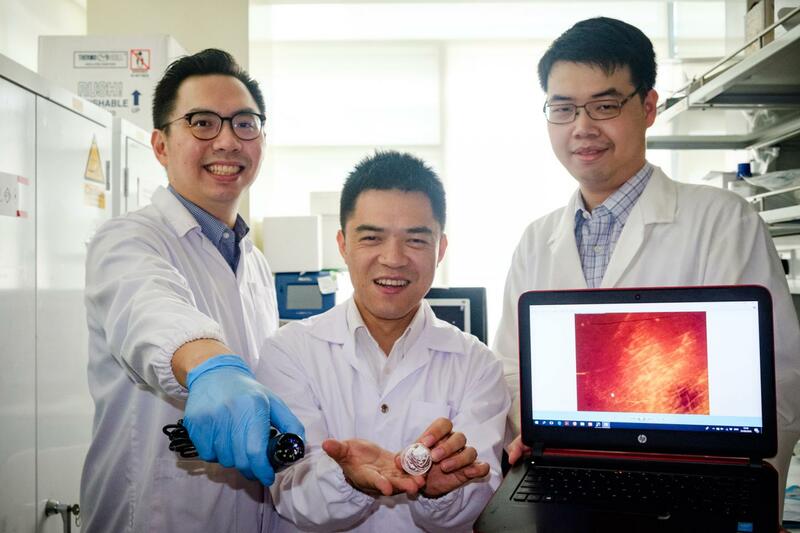 A new way of seeing when heavy wound scars are forming, and providing doctors the chance to intervene, has been developed by scientists from Nanyang Technological University, Singapore (NTU Singapore) and Northwestern University in the United States. Clinicians currently find it difficult to predict how scars will develop following surgery or after a burn wound, without resorting to invasive testing. Using new nanoparticles, the joint research team has shown in animals and human skin samples the potential to quickly and accurately predict whether a wound is likely to lead to excessive scarring as occurs in keloids and skin contractures. If necessary, doctors can then take conventional preventive measures to reduce scar formation, such as using silicon sheets to keep a wound flat and moist. In developed countries alone, about 100 million patients will form scars annually, arising from 80 million elective and trauma surgery operations. In Singapore, an estimated 400,000 people (1 in 12 people undergoing procedures) develop scars each year due to surgery. The new technique was developed by a team led by Assistant Professor Xu Chenjie from NTU's School of Chemical and Biomedical Engineering, nanoscience expert Professor Chad A Mirkin from Northwestern University, United States, and Dr Amy S Paller, Chair of Dermatology at Northwestern University Feinberg School of Medicine. Published last month in the Nature Biomedical Engineering journal, the new detection method uses thousands of nanoparticles called NanoFlares, which have DNA strands attached to their surfaces like a ball of spikes. These nanoparticles are applied to closed wounds using a cream. After the nanoparticles have penetrated the skin cells for 24 hours, a handheld fluorescence microscope is used to look for signals given out by the nanoparticles' interaction with target biomarkers inside the skin cells. If fluorescence signals are detected, they indicate abnormal scarring activity and preventive action can be taken to hopefully avoid heavier scarring. Currently, apart from the visual examination of mature scars, the only other tool to detect skin diseases accurately is to perform a biopsy, where a skin tissue sample is extracted and sent for laboratory testing. These biopsies may be painful and inconvenient for patients, as an open wound also risks infections and needs sutures which must be removed later. Assistant Professor Xu Chenjie said: "When our bioengineered nanoparticles are applied on the skin, they will penetrate up to 2mm below the skin surface and enter scar cells." "Upon binding with a specific tell-tale gene released by the scar cells, smaller DNA spikes are knocked loose and light up under the microscope like little light flares. The more flares we see, the more scarring activity there is." These NanoFlares are made by coating Northwestern's patented gold nanoparticles with tiny DNA strands targeting particular genes. It has shown negligible toxicity or side effects when tested on mice, rabbits and on human skin samples. Dr Amy S Paller, who is also the Director of Northwestern University Skin Disease Research Centre, said: "Beyond clinical observation, the gold standard for both clinical diagnosis and translational research of skin disorders is a biopsy. "This technology is an exciting first step towards having a non-invasive way to detect increases or decreases in gene expression. NanoFlares may prove to be a new tool to facilitate sub-phenotyping of disease based on expression patterns and leveraging gene expression changes as a sensitive way to detect early treatment responses." Dr Hong Liang Tey, Dermatologist and Head of Research at National Skin Centre, Singapore, who is not involved in this study, said: "This technology (NanoFlares) that can provide non-invasive biopsy for different types of skin disease, can potentially be very helpful in clinical practice and its applications should certainly be further explored". The NanoFlares took two years to research by the joint team, which included NTU research fellows Dr David Yeo and Dr Christian Wiraja, who conducted the laboratory experiments. In other recently published or accepted peer-reviewed journal articles, such as in a SLAS Technology commentary, Dr Yeo further elaborates on the potential applications of NanoFlares for other skin diseases such as skin cancer, since the DNA sequences on the nanoparticles are interchangeable. This new method could be a supplementary tool to monitor and analyse other skin diseases which conventionally rely heavily on biopsies for detection. Now that the NanoFlares are proven to be able to bind to a target biomarker and give easy visual detection, in theory, different DNA spikes could be engineered to target biomarkers abundant in other common skin diseases. The team has filed a patent application based on this technology through NTU's innovation and commercialisation arm, NTUitive, and plan to license out the technology for commercialisation. Ranked 11th in the world, NTU is top in Asia and has been placed the world's top young university for the past four years. The University's main campus is frequently listed among the Top 15 most beautiful university campuses in the world and it has 57 Green Mark-certified (equivalent to LEED-certified) building projects comprising more than 230 buildings, of which 95% are certified Green Mark Platinum. Apart from its main campus, NTU also has a campus in Singapore's healthcare district.